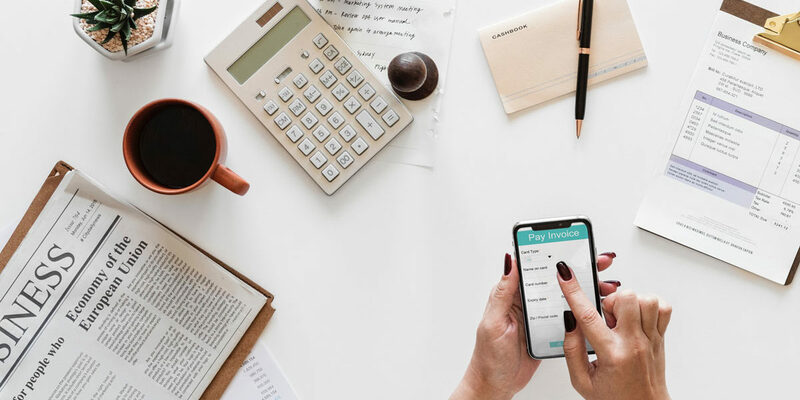 Whether you use accounting software like Quickbooks, an Excel spreadsheet or your an old school ledger book, the ultimate goal of bookkeeping is to reconcile a trial balance. Said another way, the final total of debits and credits must match in order to complete the reconciliation of your accounts. As you may already be aware, this is often a tedious process since it involves comparing your record of transactions to your bank statement and importantly, being able to explain any discrepancies. However, it is essential if you want to have an accurate view of your cash flow position and know exactly where your business stands on a consistent basis. 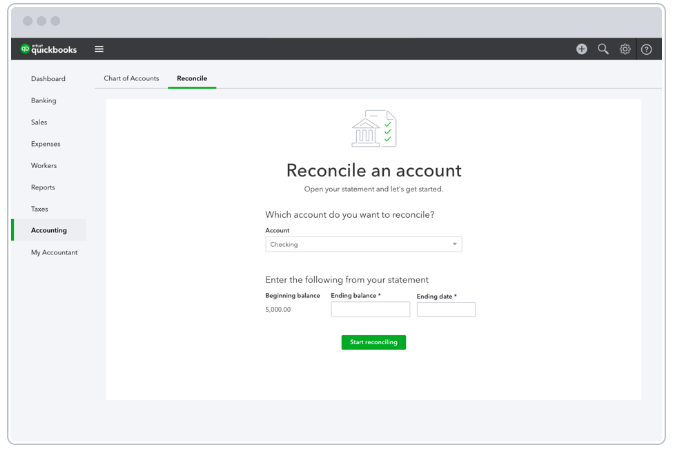 That being said, let’s review the basics of bank reconciliation for small business and how you can reconcile your accounts using QuickBooks. Detect Fraud. According to Chron, “Because bank reconciliations match a company’s disbursed checks with the cleared checks on the company’s bank statement, a careful review based on appropriate controls and procedures helps to reveal fraudulent activities.” Examples include unauthorized payments to employees and vendors. Prevents Overdraft. Many banks offer overdraft protection but this comes at a fee. By conducting bank recon on a consistent basis, you’ll know exactly how much you have in your account thereby reducing the potential for overdrawing. Identifies Bank Error. The most common occurs when the bank records an incorrect amount on your bank statement. You should always notify your bank of any discrepancies that you come across during the bank reconciliation process. Allows You to Forecast Like a Pro. The ability to create forecasts for your small business is an incredibly powerful tool. And having accurate data is an important starting point to achieving that goal. Be sure to sync QuickBooks to your bank, credit cards, PayPal, Square and any other payment system you may use. This will authorize QuickBooks to import and organize your transactions, making reconciliation a much simpler process. Step 2: Choose the account you want to reconcile. In general, you’ll only need to reconcile your bank and credit card statements. Step 3: Enter the Ending balance and Ending date. This refers to the amount of money you had in your bank account or that you owed on your credit card at the end of the statement period, respectively. Step 4: Hit “Start Reconciling”. 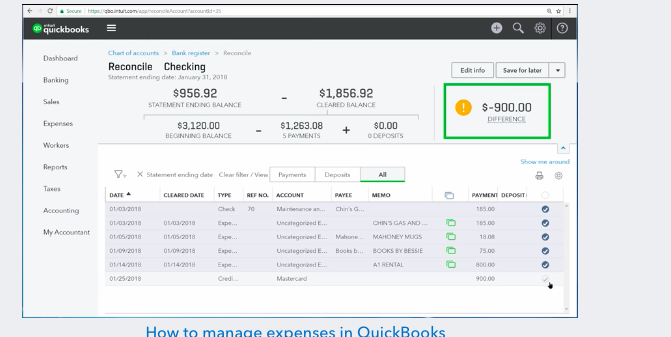 If you have connected online banking to QuickBooks as suggested above, you’ll notice that some of the transactions will already have check marks beside them in the Reconciliation window. These are pre-approved transactions that have been downloaded directly from your bank or credit card company. Transactions with no check marks were manually entered by you or another employee and have yet to be reconciled. Armed with a copy of your bank statement, you can begin to check off matching transactions one-by-one by checking the box. The aim is to confirm the amounts (and the dates) of transactions. Manually entered transactions: When recording manually, there is much more room for mistakes such as transposition errors. Fortunately, these are usually easy to spot. If the discrepancy is divisible by 9, then you’ve got a transposition error. For example, let’s say that you wrote a check to a vendor for $253, but you manually entered the transaction as $235 in your accounting software. In this case, the reconciliation difference would be $18; a number divisible by 9. 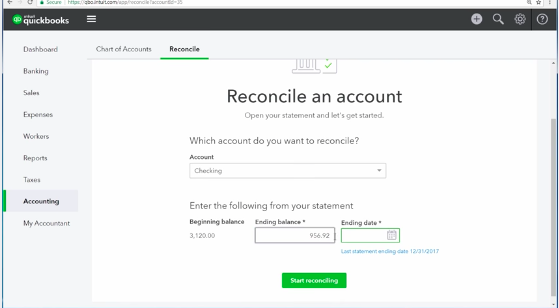 Incorrect Ending balance or Ending date: You can go back and update these inputs in QuickBooks by using the Edit feature in the Reconciliation Window. Missing Transactions: Check for missing transactions that appear on the bank statement but which you might have forgotten to record in your account software. Add any missed transactions to QuickBooks under the appropriate category. Deposits in Transit and Outstanding Checks: If you accepted a check on the closing date of the bank statement, there’s a good chance that this transaction will appear on your next statement balance. In this case, you will need to adjust (increase) your bank balance by the total amount of deposits in transit. On the other hand, if you wrote checks close to the end of the statement date, they likely have not yet cleared. In this case, you should adjust (decrease) your bank balance by the amount of the outstanding checks. In QuickBooks, the Missing Checks Report and the Check Detail Report are useful tools to identify discrepancies related to checks. According to QuickBooks, “As long as the difference is small relative to your bank account balance, don’t waste time spinning your wheels. Most reconciliation modules allow you to label the difference as a reconciliation error.” There’s a good chance that you will be able to identify the missing transaction when you reconcile the books next month. Bank reconciliation is yet another business critical function to add to your already long to-do list as a small business owner. Transferring this task to a team of experts frees up your time so you can focus on growing your business instead of running your business. At Remote Quality Bookkeeping, our banking specialists will update all of your bank accounts and credit cards in QuickBooks once per week as part of our bookkeeping services. These weekly cash reconciliations ensure that all reports will be accurate and up-to-date. This will help you to make informed business decisions. At the end of each month, our banking specialists will also reconcile your accounts and send you an email with any questions regarding income and expenditures from the past month. To find out more about Remote Quality Bookkeeping bank reconciliation services, click here. Our highly skilled bookkeeping team is ready to make your life easier.